Our Stolen Future: Trevor Butterworth, Bisphenol A poseur uncovered. For the last several years virtually every publication of a major new scientific finding about the health risks of bisphenol A and phthalates has been met with a withering rejoinder from an organization based at George Mason University called STATS. STATS has never published an article that finds scientific findings like these credible. It always has attacked, both the science and the scientists. This puzzling uniformity -- surely all research funded by the National Institute of Environmental Health Sciences (and comparable agencies in other countries) can't be wrong-- has left scientists working on both compounds puzzled. What is STATS' agenda? "Since its founding in 1994, the non-profit, non-partisan Statistical Assessment Service - STATS - has become a much-valued resource on the use and abuse of science and statistics in the media. Our goals are to correct scientific misinformation in the media and in public policy resulting from bad science, politics, or a simple lack of information or knowledge; and to act as a resource for journalists and policy makers on major scientific issues and controversies." The consistent bias of its analyses created suspicions that STATS funding might come, at least in part, from places within or tied to the chemical industry, but until now efforts to explore STATS funding have only reported that STATS has received significant funding from conservative (often libertarian) foundations that provide support to many institutions working to oppose government regulation. STATS own website currently (23 August 2009) has no information about funding sources. STATS chief author writing about bisphenol A has been Trevor Butterworth. According to STATS website, Butterworth is trained in philosophy and has an MS in journalism, but no scientific training. Most recently, he published a lengthy analysis of "Science Suppressed: How American Became Obsessed With Bisphenol A." In doing research for this article, he identified himself to at least one scientist, Dr. Fred vom Saal (University of Missouri) in an email "questions from journalist." The report received some attention, including a citation by reporter Gina Kolata in a blog entry for the New York Times. She introduces it as follows: "The claims about the dangers of the chemical bisphenol-A, or BPA , get a skeptical look in a report by a nonpartisan, nonprofit group, STATS." Now a lengthy investigative story by Meg Kissinger and Susanne Rust (Milwaukee Journal Sentinel, 23 August 2009), BPA industry fights back, reports that Butterworth is a poseur, claiming to be a journalist but in fact participating in a broad effort by the bisphenol A industry to protect this material from government regulation. Based on a review of its financial reports, STATS, according to the Milwaukee Journal Sentinel, is really a branch of the Center for Media and Public Affairs. According to the MJS, "that group was paid by the tobacco industry to monitor news stories about the dangers of tobacco." Collaboration between the tobacco and chemical industries in fighting regulations and misrepresenting science has a long history, well documented in internal memos from the tobacco industry that were never meant to see the light of day, but became available through legal discovery processes. The fact that STATS has not been forthcoming about its funding sources (nothing on the website) should have been a red flag for journalists like Kolata. Perhaps it played to her biases. With these revelations from the Milwaukee Journal Sentinel, at last STATS (and Butterworth's) cover is blown. Journalists who take these people seriously are a disservice to their profession. 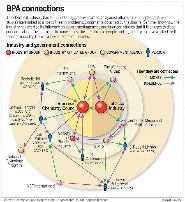 Also of note in the MJS coverage is a graphic summarizing links between chemical industry players like the American Chemistry Council (the chief trade assocation of the chemical industry) and the tobacco industry. Click the image for a link to a full-size version on the MJS website.